As a local not-for-profit financial co-op, we are owned by the people we serve - thousands of your friends and neighbors - and not a few wealthy stakeholders. We put our membership's best interest first and we care for the communities we serve. And because we are one of the largest credit unions in Washington State, we have the financial strength and expertise to help you as your business grows. Join us and let's do life together! We have checking accounts to fit any sized business. Other Transaction Charges * First 100 transactions are free each month. $0.50 per transaction after the first 100. First 100 transactions are free each month. 101 - 250 is $0.25 per transaction. 251+ is $0.35 per transaction. Cash / Coin Received and/or Disbursed The first $5,000 per month is free, then .1% over $5,000. The first $5,000 per month is free, then .1% over $5,000. * Transactions include: Checks cleared, checks deposited, all external debits and credits (internal transfers not included, defined as 'within the members business account'). Debit card transactions not included in transaction counts. Business Checking is a great choice for businesses with low transaction volumes as it provides all the convenience and flexibility you need while minimizing expense. There is no monthly service charge. Business Checking includes free online/mobile banking, e-Statements, Visa Debit Card, and 24-hour phone banking. Is your business a little larger? Gain all the access of Business Checking plus more with Elite Business Checking. It pays competitive dividend rates and has a low monthly service charge that may be partially or fully waived based on your average daily balance or active business loan. See current Business Rate and Fee Schedule for more information. 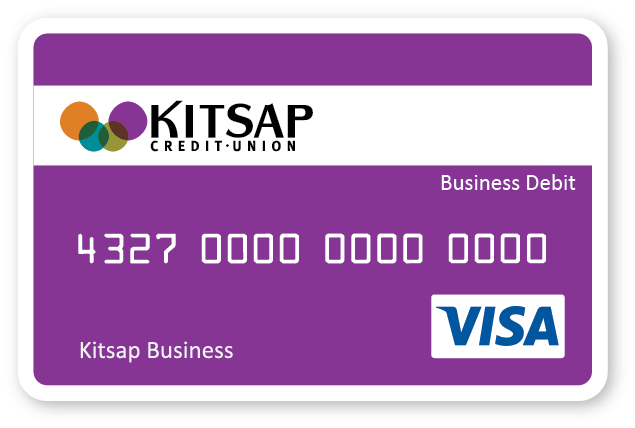 A Business Debit Card is an essential tool in running your business. Whether you need one for your sole proprietorship or multiple cards to facilitate purchases by your employees - you have options. Managing your business is made easier with Online Banking. Check your balances, transfer funds, view images of cleared checks, and much more. You can even establish additional online banking users and limit their access to meet your needs. For example, provide your accountant or CPA authority to view your account history, while restricting their ability for transactions.